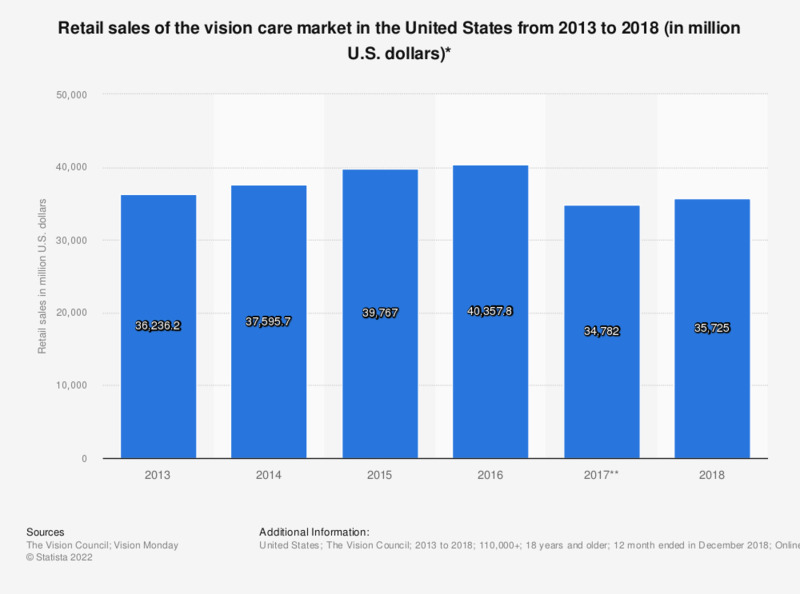 This statistic depicts retail sales of the vision care market in the United States from 2013 to 2017. In 2016, the U.S. vision care market generated approximately 40.36 billion U.S. dollars, up from 39.77 billion U.S. dollars the previous year. * All retail includes dollars spent at all retail types at any retail location on the sale of either spectacle lenses (including Rx sun), frames, contact lenses, sunglasses (plano), OTC readers or revenue earned from refractive surgery (LASIK only) or eye examinations. Does not include sunglass clips and does not include retail dollars spent by/for contact lenses and exams for those 17 years of age and younger. **Vision care products and services sold at optical retail locations. Everything On "Vision problems in the U.S." in One Document: Edited and Divided into Handy Chapters. Including Detailed References.